52 | TH E M R EP O RT O R I G I NAT I O N S E R V I C I N G A NA LY T I C S S E C O N DA R Y M A R K E T ANALYTICS THE LATEST Metro Home Prices Surge in Tight Market Conditions The number of markets reporting increasing prices is on the rise, according to the National Association of Realtors. A n uptick in home sales coupled with scarce supply levels kept home prices on the rise in the majority of metro areas during the first quarter of the year. The National Association of Realtors' (NAR) latest quarterly report found the median existing single-family home price increased in 87 percent of measured markets, or 154 out of 178 metros, in the first quarter compared to the first quarter of 2015. Only 24 areas, or 13 percent, experienced a decrease in home prices. According to the NAR, more markets experienced home price gains in the first quarter of this year than in the previous quarter when gains were reported in 81 percent of metro areas. Double- digit increases were observed in 28 metro areas (16 percent) in the first quarter, down from 30 areas in the fourth quarter of 2015 and 51 areas in the first quarter of 2015. Lawrence Yun, NAR Chief Economist said, "The solid run of sustained job creation and attrac - tive mortgage rates below 4 percent spurred steady demand for home purchases in many local markets. Unfortunately, sales were somewhat subdued by supply and demand imbalances and broadly rising prices above wage growth. As a result, the path to homeownership so far this year remains strenuous for a seg - ment of prospective buyers in the most competitive areas." NAR's five most expensive housing markets in the first quarter were the San Jose, California, metro area, where the median existing single-family price was $970,000; San Francisco, California, $770,300; Honolulu, Hawaii, $721,400; Anaheim-Santa Ana, California, $713,700; and San Diego, California, $554,300. Meanwhile, the five lowest-cost metro areas in the first quarter were Cumberland, Maryland, $67,400; Youngstown- Warren-Boardman, Ohio, $77,500; Decatur, Illinois, $83,300; Wichita Falls, Texas, $95,200; and Rockford, Illinois, $95,800. The report showed the national median existing single-family home price in the first quarter was $217,600, up 6.3 percent from the first quarter of 2015 when the median price was $204,700. Existing-home sales also rose 1.7 percent to an annual rate of 5.29 million in the first quarter from 5.20 million in the fourth quarter of 2015, and are 4.8 percent higher than the 5.05 million pace during the first quarter of 2015. Inventory levels were at 4.3 months supply in the first quarter, down from 4.6 months a year ago, NAR reported. There were 1.98 million existing homes available for sale in the first quarter, which was below the 2.01 million homes for sale at the end of the first quarter in 2015. "In spite of deficient supply lev - els, stock market volatility and the paltry economic growth seen so far this year, the housing market did show resilience and had its best first quarter of existing-sales since 2007 (5.66 million)," Yun stated. "The demand for buying is there, but unless the stock of new and existing-homes for sale increases significantly–especially in several markets in the West–the housing market will struggle to reach its full potential." Education Plays an Influential Role in Homeownership The gap in homeownership between those with higher education and those without is widening. T he progression of homeownership across the United States is declining, and educational attainment is a leading factor in the direction of these numbers, according to a recent market study. First American Financial Corporation's Homeownership Progress Index released in May determined the falling homeownership progress in the United States shares a special correlation with education levels of consumers. According to the report, the index declined 1.8 percent year- over-year, and is down 7.6 percent from its peak in 2005. In addition, the index is currently just 0.4 percent above the 25-year low point set in 1995. "Homeownership's year-over- year decline in 2015 is no longer a story of economics and a housing crisis correcting the excesses of the mid-aughts. Tectonic demographic shifts taking place as the economy transitions from Baby Boomers to Millennials are causing homeownership rates to transition, too," said Mark Fleming, Chief Economist at First American. 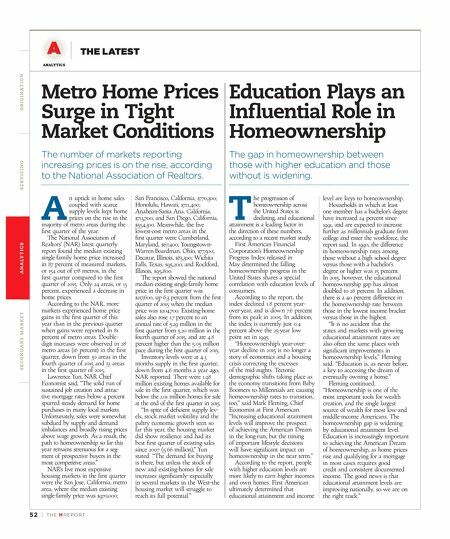 "Increasing educational attainment levels will improve the prospect of achieving the American Dream in the long-run, but the timing of important lifestyle decisions will have significant impact on homeownership in the near term." According to the report, people with higher education levels are more likely to earn higher incomes and own homes. First American ultimately determined that educational attainment and income level are keys to homeownership. Households in which at least one member has a bachelor's degree have increased 24 percent since 1991, and are expected to increase further as millennials graduate from college and enter the workforce, the report said. In 1990, the difference in homeownership rates among those without a high school degree versus those with a bachelor's degree or higher was 15 percent. In 2015, however, the educational homeownership gap has almost doubled to 28 percent. In addition, there is a 40 percent difference in the homeownership rate between those in the lowest income bracket versus those in the highest. "It is no accident that the states and markets with growing educational attainment rates are also often the same places with significant improvements in homeownership levels," Fleming said. "Education is, as never before, a key to accessing the dream of eventually owning a home." Fleming continued, "Homeownership is one of the most important tools for wealth creation, and the single largest source of wealth for most low-and middle-income Americans. The homeownership gap is widening by educational attainment level. 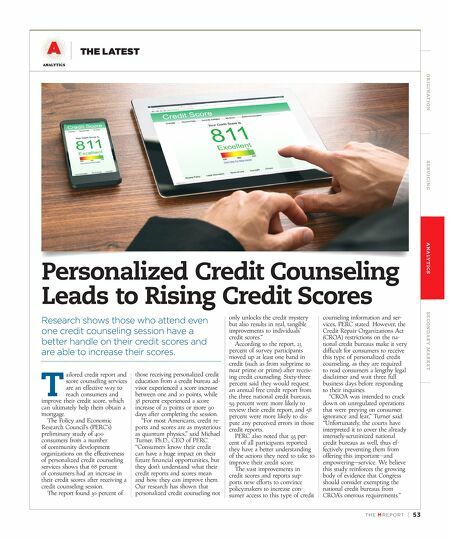 Education is increasingly important to achieving the American Dream of homeownership, as home prices rise and qualifying for a mortgage in most cases requires good credit and consistent documented income. The good news is that educational attainment levels are improving nationally, so we are on the right track."